In this edition of Industry Perspectives, Mark Feasel, vice president, Electric Utility Segment & Smart Grid, Schneider Electric, discusses top considerations for choosing the ideal microgrid partner. Urbanization, industrialization and digitization continue to shape our lives as new economies are built, and established economies are rebuilt and transformed. At the same time, the quest for economic growth and development is straining our planet’s resources. Microgrids have emerged as a proven solution to achieve better sustainability and resilience, while also helping businesses meet financial objectives. However, rapidly emerging technologies and evolving regulations can make this journey difficult. How can business stakeholders make sure they are choosing the right microgrid partner for their next energy infrastructure project? Modern microgrids augment existing infrastructure with distributed generation, energy storage, and load optimization technology. While consumers desire the benefits these improvements will bring, it doesn’t make sense for all consumers to finance, own, operate, optimize and maintain this infrastructure. Energy is a contributor to their business objectives, but that doesn’t mean all consumers have the tools, technical competence, access to flexible capital, and regulatory insight on-staff to handle all facets required of a “prosumer” in the new energy landscape. Instead, many consumers value a business model that delivers predictable costs, resilience and sustainability while a partner handles the complexity and risk of owning and optimizing a microgrid. Together with Dynamic Energy Networks, Schneider Electric delivers a Microgrid-as-a-Service business model that empowers a consumer to choose exactly how they will deploy their capital and staff to optimize energy with their business objectives. Using a balanced scorecard approach, we can deliver a wide array of outcomes including: no capital outlay, elimination of costs associated with the maintenance and operation of energy assets, tax incentive optimization, access to wholesale market programs, lower energy costs, more predictable energy costs, increased sustainability and better resilience. Digitization is transforming how we think about energy and is the cornerstone of a modern microgrid. Data highlights the degree of alignment between a consumer’s energy requirements and the nature of energy that is available from the centralized grid. Additionally, data provides deep insight into how distributed energy resources (DER) operate and facilitate the delicate balance between supply and demand that must exist to reliably deliver energy. At the core of Schneider Electric’s approach to microgrid is EcoStruxure – an open and interoperable framework for the Internet of Things (IoT) that ensures we can integrate both existing infrastructure and new technology in a secure and dependable architecture. The structure is modular, scalable and tailored to various business segments. We understand a commercial building’s business system and infrastructure is different than that of an industrial facility, and microgrids must operate within the context of each of these different ecosystems. Increasingly open energy markets, in association with digitization, bring new opportunities to solve problems through flexibility of both energy demand and supply. Schneider Electric’s EcoStruxure Microgrid Advisor (EMA) – a cloud-based, demand-side energy management software platform – manages flexibility and simplifies the integration of DER while optimizing their operation using predictive algorithms. Through EMA, we can leverage flexibility to get the most out of renewable energy sources, optimize for economic benefit, and improve energy resilience through storm hardening strategies. 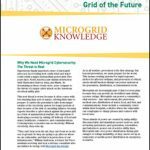 Microgrids leverage advanced technology to transform how distributed generation and loads interact with the grid. The solutions often encompass new technology and can be highly-engineered and capital intensive. Often, the infrastructure deployed will need to operate at peak performance for 20 years or longer. Choosing secure and bankable partners with the flexibility to leverage new business models mitigates the risk of embracing these advances. Last November, Schneider Electric formed a strategic alliance with Dynamic Energy Networks, backed by The Carlyle Group, who has approximately $200B of assets under management, is one of the world’s leading investor in multiple technologies. Together, we aim to transform the market by offering a platform to own and operate microgrids for organizations and institutions that demand more out of energy than they are getting today. We offer the global reach and domain expertise to deliver Energy-as-a-Service anywhere in the world, and the staying power to deliver the outcomes to which we commit. Mark Feasel is VP electric utility segment and smart grid at Schneider Electric. There is a lot of new software technology, this cannot solve or closed the intermittent gap caused by wind and solar which is the main renewable source in the microgrid . What we need to do is to deploy new non intermittent renewable systems in the Microgrid.Doing the same thing over and over the same way is border lining lunacy.There is technology out there other than solar and wind such as decentralized hydro technology that is a non intermittent renewable source.Most companies like solar and wind very much because they can add storage.The storage system cannot solve the problem this is only a Band-Aid.The companies need to wake up smell the coffee and face reality.Be brave and invest in renewable energy technologies that can solve the problems and stop worrying about partners with the most updated automation technology that is and will always be available it is the easy part.